This post contains affiliate links. By clicking on links provided in this post and making a purchase through those links, I receive a small compensation. I was both financially compensated and received product for free for this post. All thoughts and opinions are my own base off my experience. Summer is all about change and my friends over at Gymboree just re-imaged their entire brand! If you haven't checked it out yet, you need too. I am loving the new look. You might be asking. Well, every thing! Down to the last stitch on their products, the overall quality and comfort of fabrics. The new styles that have that same kid sensibility with a modern twist that will leave your little sir or misses looking extra stylish effortlessly. All of the new pieces are versatile and can be mixed and matched for your child to create their own unique look. Not only will your son or daughter be looking fashionable with their sense of style but they will be comfortable and wrapped in the softness of great quality fabrics that still maintain a great attention to detail in each piece. Even their new denim is super comfortable, soft, and extra durable which I love! They are being dubbed as "the best jeans ever!" I plan on stocking up on them when I go back to school shopping for my son's. My two boys are hard on their denim and these new jeans won't be getting any holes in them once school starts. Gymboree has even made more changes for the sweet little babe in your life. Their new pieces are made with the coziest and comfiest of fabrics. Their are more neutral hues and modern details making many of their pieces gender neutral and perfect for both a boy and a girl. I can't wait to go shopping for my new niece and nephew. These items are perfect for a baby shower gift or a "welcome to world" gift too. 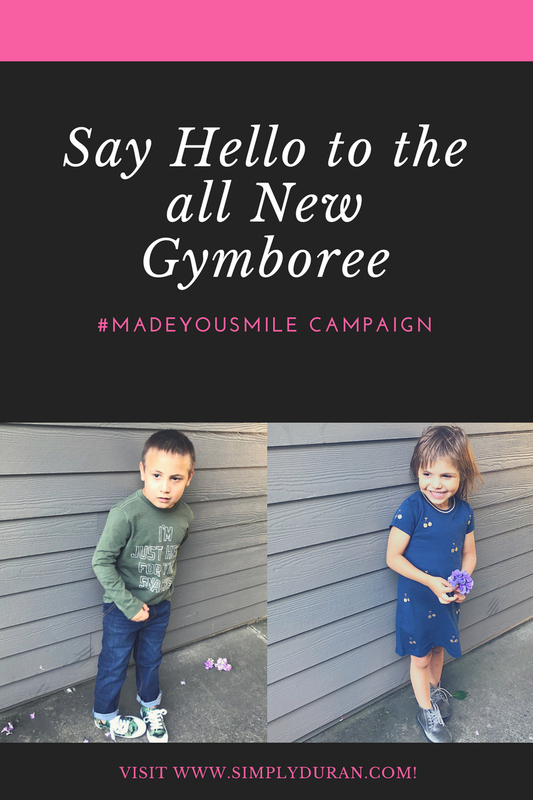 What I love most about the #MadeYouSmile Campaign with Gymboree is that no matter what, my kids always have nothing but smiles on their faces. Who would have thought that a new top or dress and some flowers would put a smile on their faces. Head on over to Gymboree and check out their new styles for back-to-school season! I know I plan on doing some online shopping later on tonight while I drink a glass of iced tea and watch the sun set on the patio. I know my boys are excited about the Get Ready for School collection for boys and my daughter loves the So Ready for School collection for girls. Amari is wearing the "Oh Yeah Hoodie Shirt" and paired with his favorite jeans and cameo sneaks. He picked this top out for himself and loves it. He likes the color, the fact that it has a hood, and that he looks cool in it. Its a little spendie, but totally worth the price and it will be a great piece during the fall and winter months when the weather cools down here in the northwest. Aurora is wearing the Navy Cherry Shift Dress and paired with her favorite boots. What she loves about this dress is the color and the metallic cherries. She calls it her beautiful dress and she looks adorable and stylish in it too. I love that it is easy for her to dress herself and the softness of the material is amazing. I highly recommend this dress. Right now they are having a buy 2 or more, for $12 each deal going on for girl's tops. Talan is wearing the "Just Snacks" tee in olive green. When we saw this, we laughed because it sums up his personality in a nut shell. The tee is so, so, soft! The quality is high and I will be buying more of these tee's. Right now they have a buy 2 or more, for $14 each deal going on. Thanks for visiting the blog today. And happy shopping at Gymboree! They have some amazing deals going on right now so stock up on back-to-school essentials now.